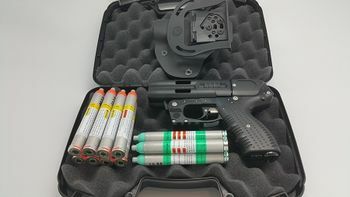 The JPX4 may look like a large 4-barrelled Derringer with some modern twists, however, the Bureau of Alcohol, Tobacco, Firearms, and Explosives (BATFE) issued a ruling dated October 15, 2014 that clearly states that the JPX4 "does not constitute a firearm". The JPX4 offers a greater distance deployment opportunity that may help alleviate most of the cross-contamination problems in the initial stages of controlling a resistive subject. Going hands on for handcuffing may still subject officers to chemical agent exposure, but that is likely to be much less than the close quarters hand cans. The JPX4 Shot Defender marks the beginning of the next generation of pepper guns. The JPX4 Pepper Gun comes with a specially designed laser and amazing range and speed. This is the only pepper spray gun that can shoot four individual shots of pepper spray bullets at 590 feet per second (FPS). This is the speed of the bullet (pepper spray cartridge) from the nozzle of the gun up to a distance of 23 feet. The premise of the JPX4 is to provide a longer range, less lethal, OC spray delivery system. Common hand-held units are generally only dependable to about 10 feet or less. Some fogger style delivery systems may provide a slightly longer distance, but hand-held OC spray cans have always been seen as an "up close and personal" type of defensive and control device. The JPX4 seeks to double that range. The JPX4 Shot Defender is a brand new product offered to Law Enforcement by Piexon AG. This is the only product that can fire 4 separate shots of pepper spray at 590 FPS from the nozzle up to 23 feet. Most Less-lethal devices are limited in range and reliability. The JPX 4 fires using actual primers making it a very reliable weapon. It has been certified by ATF as a non-firearm with no registration required. Each removeable cartridge fires exceptionally potent liquid 10% OC at 590 FPS from the nozzle with an effective distance of 23 feet. With ease of training and the power of each super-strong pepper payload has made the JPX very popular among law enforcement and corrections professionals world-wide. The JPX 4 carries four self-cleaning pepper rounds, making multiple shots available when needed. Reloading is fast and easy. You can load each round individually so that you always have 4 rounds available. Opinion from the ATF: The Piexon JPX does not constitute a "firearm" as defined in the Gun Control Act or a "firearm" or "any other weapon" as defined in the National Firearms act. Also, the magazines designed for this device do not constitute "ammunition" as defined in the Gun Control Act". NO REGISTRATION REQUIRED IN MOST STATES.